Lent invites us to enter into solidarity with the Lord by expressing our love for him and others by giving and by giving up. 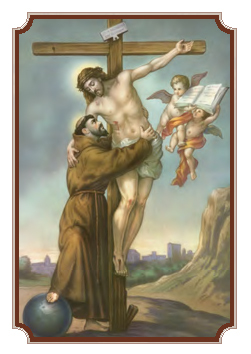 I invite you to consider giving to the work of the National Shrine of St. Francis of Assisi as one of your Lenten observances. By doing so, you will become a cooperator in our ministry here in The Heart of San Francisco, offering people a place of solace and peace, whether it be in the Shrine church or its Lady Chapel, La Nuova Porziuncola. People from all over the globe make pilgrimages here, or just visit, to enjoy being in the Lord's presence and to gain the benefit of the graces and indulgences with which the Shrine has been endowed by Pope Benedict XVI. Your gift helps to make it possible for pilgrims and visitors to enjoy these spiritual benefits. When Easter Sunday arrives, having accompanied Jesus to the cross through our own sacrifices, we will rise to new life with him. Singing "The strife is o'er, the battle done...Alleluia!" can have so much more power and significance when we have actually joined the Lord in the battle against sin and death through our acts of self-denial and charity. We will remember you and your intentions in our prayers and Masses here at the National Shrine of St. Francis of Assisi, especially on Easter Sunday and during the Octave of Easter which follows. I invite you to let us know what your intentions are so they can be placed on the altar. Even if you cannot make a monetary donation at this time, we want to pray with you and for you and ask that you pray for us as well. Thank you for your continued support for the National Shrine of St. Francis of Assisi. May your Lenten journey lead you to a marvelous experience of newness of life when we celebrate the Solemnity of the Lord's Resurrection and his triumph over sin and death. God bless you!